San Simeon State Park is one of the oldest units of the California State Park System. The coastal bluffs and promontories of the scenic park offer unobstructed views of the ocean and rocky shore. The park includes the Santa Rosa Creek Natural Preserve, the San Simeon Natural Preserve and the Pa-nu Cultural Preserve were established in 1990. A 3.3 mile trail runs through parts of the San Simeon Natural Preserve and the Washburn Campground. The trail includes scenic overlooks, rest-stop benches and interpretive panels with information on wildlife and habitat. A portion of the trail along the seasonal wetland is wheelchair accessible. The San Simeon Creek Campgrounds offers 115 campsites for tent camping or recreational vehicles. The maximum length for a RV is 35 feet. Each campsite has a fire ring and picnic table. Water spigots are available throughout the campground. Restrooms with flush toilets and coin operated showers, a dump station and water fill-up for RV's, and pay phones are also available. Firewood is for sale from the campground host. Recreational activities include camping, picnicking, hiking, fishing, surfing, beachcombing, bird watching and whale watching. The Junior Ranger Program is a regularly scheduled interpretive program for children. Interpretive walks of the San Simeon Trail may also be available. This primitive campground is approximately 1 mile inland from the beach on a plateau overlooking the Santa Lucia mountains as well as the Pacific Ocean. Washburn campground can be accessed from the San Simeon Creek Campground enterance station. Facilities here include a fire ring and picnic table at each campsite, water spigots, chemical flush toilets and use of the dump station and water fill-up. 3.5 miles round tripWhat?s there to see in San Simeon besides the castle? It?s a common question asked by thousands of travelers on their way to Hearst Castle. The answer is found at San Simeon State Park, which boasts a diversity of scenery from shoreline to Monterey pine forest. A new trail, complete with interpretive displays, a boardwalk that crosses a wetland, and numerous benches that offer a place to rest and observe the tranquil surroundings. The pathway circles the park?s San Simeon Creek and Washburn campgrounds. About 0.25 mile of the path is wheelchair accessible. Back in the 1880s, the park?s 500 acres of backcountry were part of Ira Whittaker?s ranch and dairy operation. Eucalyptus was planted, both as a windbreak and for ﬁrewood to fuel the dairy?s boiler to make cheese. Botanical highlight is a stand of Monterey pine, part of the famed Cambria pines, and one of only four native groves left on earth. In winter, monarch butterﬂies, more often seen on the Central Coast in eucalyptus trees and other nonnative ﬂora, cluster in the park?s Monterey pines. San Simeon Creek is habitat for the endangered red-legged frog and Western pond turtle. Many migratory birds can be counted at the park?s seasonal wetland: cinnamon teal, mallards, egrets and herons. Directions to trailhead: From Highway 1, just south of the turnoff for San Simeon Creek Campground, turn inland and park at Washburn day-use area. Walk inland along the service road to the signed trailhead on your right. Campers can walk to the trailhead?just west of San Simeon Creek bridge?along the campground road. The hike: The path tours the eastern fringe of the seasonal wetland and soon reaches a boardwalk that leads across it from one viewing area to another. Beyond the boardwalk the trail junctions. The right fork leads southwest 0.2 mile to the Moonstone Gardens restaurant and Highway 1. Along this side trail, Eagle-eyed hikers might get a glimpse of Hearst Castle located ﬁve miles north. The main trail climbs onto a ﬂat-topped, Monterey pine-dotted ridge. A sometimes overgrown path detours left (north) two hundred yards to a scenic overlook. Our route descends from the pines into lush riparian area and turns north. A boardwalk crosses a boggy lowland ﬁlled with willow, cottonwood and a thick understory of wax myrtle and blackberry bushes. The path next ascends grassy slopes along the eastern boundary of the park. From the former grazing land, you look out over a scene from the California of a century ago: a windmill, pastoral slopes dotted with cows, the unspoiled beauty of the southern Santa Lucia Mountains. The trail skirts the edge of the campground, then leads west. Savor the mountain vistas as the path heads southwest on the bluffs above San Simeon Creek. About a quarter mile from its end the trail splits. The path you?ve been following continues above San Simeon Creek back to the day use area. A second branch crosses the campground road and leads toward the wetland boardwalk, where you turn right and retrace the ﬁrst ﬁve minutes of your walk back to the trailhead. This is a special program for kids that provides the chance to partake in a variety of fun and educational nature-oriented activities at San Simeon State Park. Parents should bring their kids to the Camfire Center at the San Simeon Creek Campground for fun regularly scheduled programs about the Central Coast. 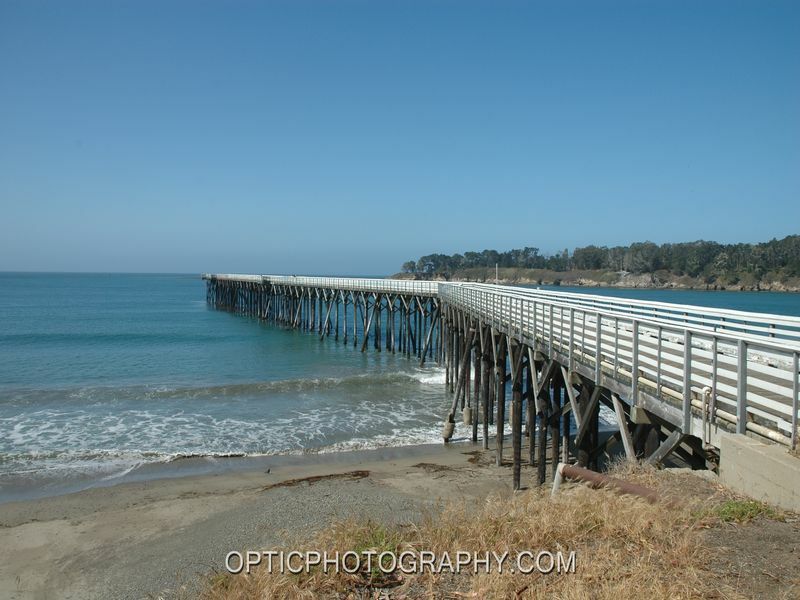 William Randolf Hearst State BeachThe beach is located near the historic town of San Simeon along Highway One and gives visitors the opportunity to hike, swim, fish and beachcomb. A popular beach spot, this protected cove also offers visitors pier fishing and deep-sea fishing from chartered boats. Ocean kayaking is also popular. Picnic tables, barbecue grills and restrooms are available.This day use area offers 24 picnic sites, 150 parking spaces, restrooms, water faucets, barbecue grill stands and easy beach access. Recreational activities include picnicking, swimming, fishing, boating, kayaking and sunbathing. There is a kayak and boogie board concession in operation with equipment for rent. Fishing licenses are not required when fishing from the pier but limits are enforced. In general, San Simeon's climate is very mild. Summer temperatures range from the high 50s to low 90s, while winter ranges between the low 40s and high 60s. The average rainfall is 22 inches with the majority of precipitation occurring in winter and spring from November to April. During the winter months fog is common along the coast, but normally burns off by late morning. However, a sweatshirt or sweater and light windbreaker can greatly increase the comfort level on foggy mornings and cool evenings. Santa Rosa Creek Preserve is an area which includes valuable riparian forests and coastal wetlands, that provide habitat for endangered Tidewater Goby. San Simeon Natural Preserve consists of vast wetlands, riparian areas, and several undisturbed native plant communities including unique mima mound topography. The Preserve is also the wintering site for monarch butterfly populations. The 13.7 acre Pa-nu Cultural Preserve contains the most significant archeological site within San Simeon State Park. The site has been dated to 5850 years before the present, and it contains significant evidence documenting prehistoric technology, subsistence practices and social organization over the course of several centuries. Made reservations for 3 days; set up camp (tent and trailer) and took dog for two walks (on leash) and the ticks and foxtails were terrible and had to leave; we were there 6 hours! We were at Washburn campground; maybe try the lower camp; not as primitive. Very disappointed.